I wish I weren’t so darned impatient. 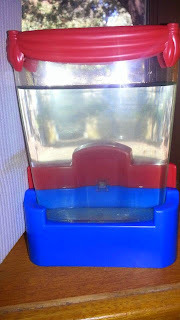 So I added my ‘Packet 1’ of water purifier, and - as the instructions indicated, sat the tank aside for the next 24hrs. 17-18hrs later, I added the eggs. My impatient side needed to cut that ‘Packet 2’ open and bring the sea-friends into the world. No movement yet….hopefully didn’t kill my new friends! Eep! Come oooon, my little bros. Hurry up and hatch! I want to meet you already!